This topic contains 194 replies, has 28 voices, and was last updated by ams 2 years, 3 months ago. You freaking nailed The Watcher! It’s hard to design characters with a lot of gear without making them look cluttered, but the plain brown cloak really helps balancing out the gadgets. Also that face is perfect. Mad Jack’s worlds of superheroes and villains! In high school, Victor Trava is an extremely bright 15 year old boy with only very few friends. Being an overweight and unathletic kid with an above-average IQ, he is a social outcast and a favorite target for bullies. But when school is over, he becomes the superhero „Vitruvian“ – a grown man who represents the pinnacle of human development and perfection. Victor has complete control over his body on a cellular level and is able to manipulate the stem cells stored in his body (thus the overweight) at will. This way he can increase his physiological maturity and transform his somatic cells into any kind of body tissue such as muscle, skeleton, and hair in order to instantly grow into an adult man whose bodily functions are augmented to the maximum limit of human condition. As the Vitruvian, his natural capabilities are near-superhuman and therefore his strength, speed, stamina, senses, agility, reflexes, accuracy, longevity, durability, intelligence, healing time, flexibility and combat skills are greatly heightened. He is strong enough to break thin steel bars with his bare hands, fast enough to outrun moving vehicles, agile enough to climb the tallest of buildings as well as to leap to high feats into the air and distant yards, reflexive enough to quickly dodge incoming attacks, durable enough to withstand superhuman physical attacks, untiringly enough to physically exert himself to peak capacity, flexible enough to coordinate his limbs perfectly, and much more. The total control over his body cells and tissues includes the ability of genetic alterations and physical distortion, which means that, if necessary, he can also grow additional appendages and body-parts, change his appearance and physical features, modificate his density/weight, and even rearrange his own internal organs and alter their functions. After the success with Riley “Red” Reddington (aka „Redback“), the Australian army wanted to replicate the procedure that gave him his superpowers and recruited another prison inmate for the same genetic treatment based on Dr. Hayden Creed‘s Xenogene studies – only this time they used a Sydney funnel-web spider (Atrax robustus) as the gene donor. The result was – as expected – an even stronger and more powerful superhuman, but they didn‘t thought of the possibility, that this testperson would not come out as heroic as Redback. 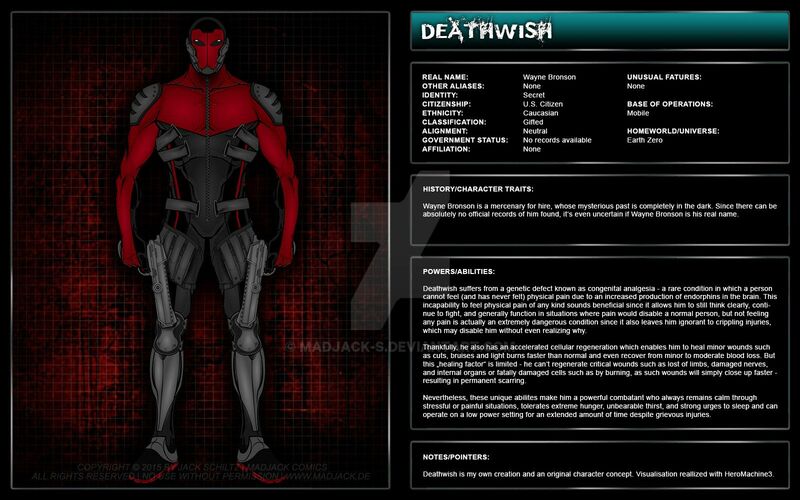 Without missing a beat, Walker Stain used his new power to escape the prison and made his way back to Sidney, where a chance encounter with other superpowered criminals inspired him to use his new powers for profit and become both an assassinfor hire and a constant thorn in the side of his arch-enemy Redback. Atrax possesses the overproportionate superhuman abilities and traits of a Sydney funnel-web spider, which – amongst others – provides him with 2 addtitional arms and a pair of spider-like appendages growing from his back which he had cybernetically reenforced to make them strong and dense enough to pierce thick steel plates and transport his organically produced, highly lethal poison that acts directly on the nervous system of humans and thus instantly kills them..
Additionally he has the ability to organically produce a silk liquid from glands in his fingers that can be used as some sort of web. He also possesses vast superhuman strength and speed, enhanced stamina and agility, and the capability to stick to virtually any surface and crawl across it or to rip a wall down just by tugging at it hard enough with his palms. After an unidentified aircraft was shot down by the military in close vicinity to the Roswell air force base in June of 1947, the salvage crew found a small spacehip with the body of an obviously extraterrestrial humanoid being inside at the crash site. The corpse of the small, grey alien creature was immediately brought in a hush-hush operation to a secret underground facility beneath the Roswell air force base, where a team of scientist from different fields, under the direction of Dr. Hayden Creed, began to study the being from another world. 1963, still working on the alien after decades of groundbreaking scientific advances like the discovery of the deoxyribonucleic acid (DNA), Dr. Creed eventually managed to decipher the structure of the double helix and unlock the secrets of the genetic code of both human and alien and discovered that they are genetically related to 99.5%. He even managed to find the gene sequence responsible for the 0.5% difference which he dubbed the „Xenogene“. But when he wanted to start experiments on human beings, his work was shut down by his superiors and his research came to a sudden halt. Shortly after the disgruntled scientist vanished with all his research records. Eleven years later, in 1974, he was found by the american soldier Ryan Murphy in the Song Be province of vietnam, where he worked on an experimental drug based on the „Xenogene“ in a secret chemical laboratory of the Viet Cong. 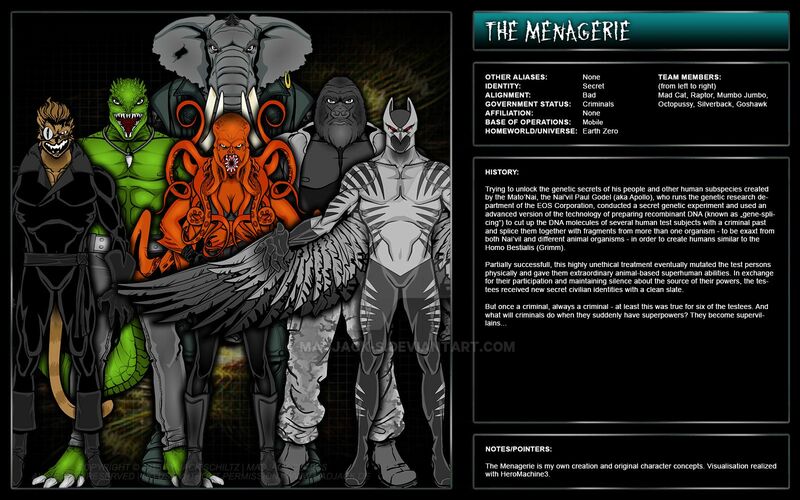 Managing to escape, he again disappeared for several decades working in the underground under various fake identities where he eventually discovered that some of his human guinea pigs had the extraterrastrial Xenogene sequence embedded in their own genetic code. But his secret experiments didn‘t remain undetected and in 2010 – now already 95 years old but still fit as a fiddle – he was finally captured by the military and brought back to Area Zero, where he continued his research under ward by the United States. 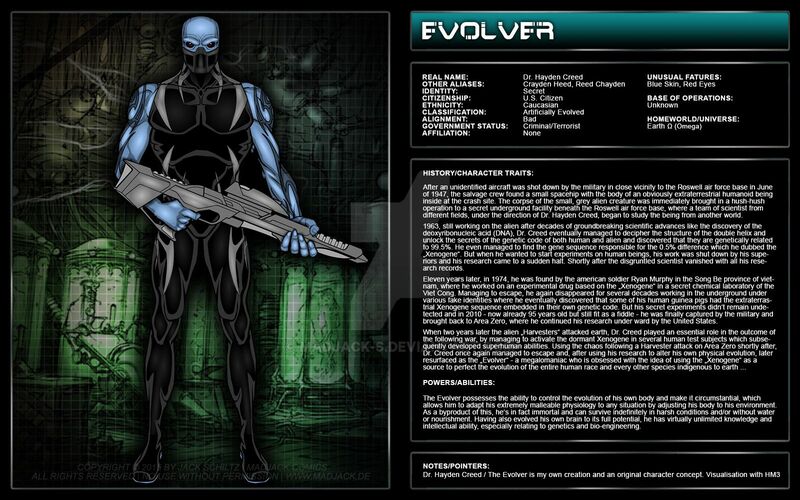 The Evolver possesses the ability to control the evolution of his own body and make it circumstantial, which allows him to adapt his extremely malleable physiology to any situation by adjusting his body to his environment. As a byproduct of this, he‘s in fact immortal and can survive indefinitely in harsh conditions and/or without water or nourishment. 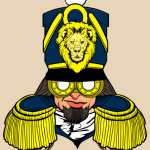 Having also evolved his own brain to its full potential, he has virtually unlimited knowledge and intellectual ability, especially relating to genetics and bio-engineering. 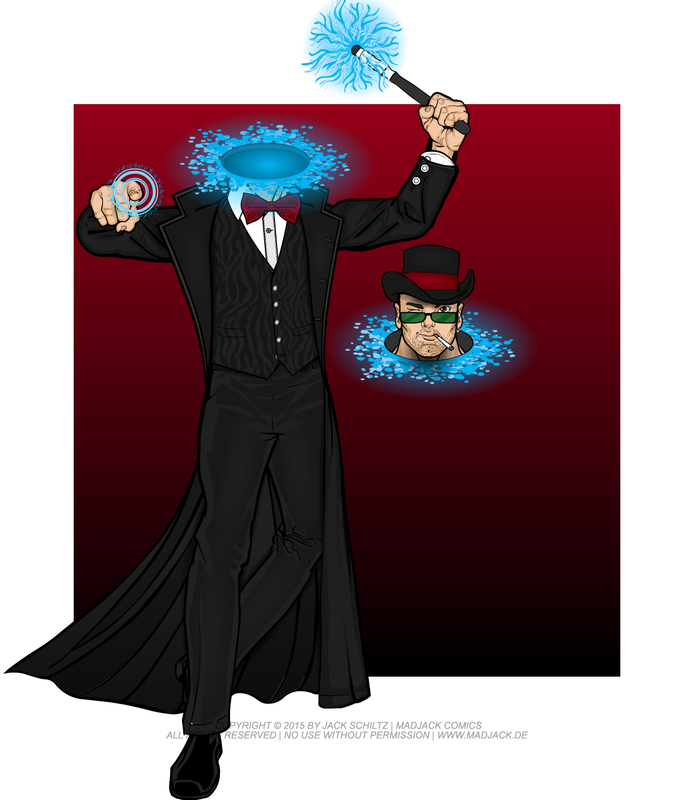 Voltage is the son of „Farad“ – a presumed dead supervillain who had the same powers as he. 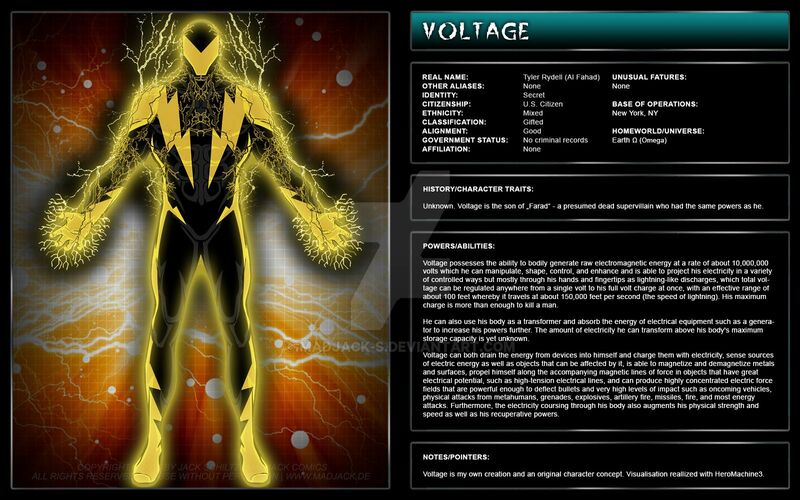 Voltage possesses the ability to bodily generate raw electromagnetic energy at a rate of about 10,000,000 volts which he can manipulate, shape, control, and enhance and is able to project his electricity in a variety of controlled ways but mostly through his hands and fingertips as lightning-like discharges, which total voltage can be regulated anywhere from a single volt to his full volt charge at once, with an effective range of about 100 feet whereby it travels at about 150,000 feet per second (the speed of lightning). His maximum charge is more than enough to kill a man. He can also use his body as a transformer and absorb the energy of electrical equipment such as a generator to increase his powers further. The amount of electricity he can transform above his body’s maximum storage capacity is yet unknown. 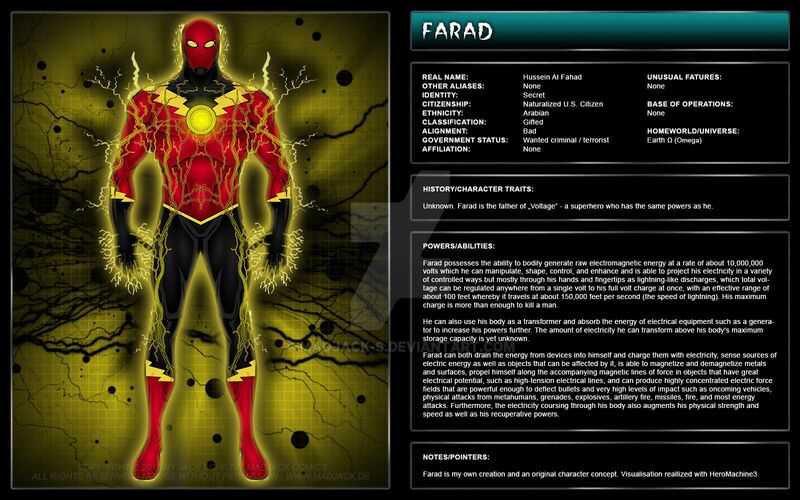 Farad is the father of „Voltage“ – a superhero who has the same powers as he. I would say that is a major improvement. I’m not entirely sure what the collar of the latest one actually is like. Is it a popped-up collar, a hood, or what, exactly? 16-year-old boy Felipé is the U.S.-born child of undocumented mexican immigrants living in Sunset Park, Brooklyn (NY), which doesn‘t make life easy for him. Aside from living in constant fear of returning home to find his family has been taken away, he struggles with ongoing discrimination in school and exposure to gangs in his neighborhoods. As a young superhero he fights for his peers and against crime on the streets. Gecko Boy has the amazing ability to walk up and adhere to most vertical surfaces such as walls and ceilings – even those as smooth as glass. This ability, combined with both his extremely enhanced agility and being “double jointed” (which means that he can hyperextend his joints – for example bend his knee or finger joints backwards – and stretch them further than normal), makes him a master of parkour and urban exploration by enabling him to go from one motion to another effortlessly, effectively dodge attacks, swing from things easily, sprint, do back-flips and perform numerous other gymnastic, athletic, martial, and acrobatic feats with little to no effort beyond even most dedicated training. Wayne Bronson is a mercenary for hire, whose mysterious past is completely in the dark. Since there can be absolutely no official records of him found, it‘s even uncertain if Wayne Bronson is his real name. Deathwish suffers from a genetic defect known as congenital analgesia – a rare condition in which a person cannot feel (and has never felt) physical pain due to an increased production of endorphins in the brain. This incapability to feel physical pain of any kind sounds beneficial since it allows him to still think clearly, continue to fight, and generally function in situations where pain would disable a normal person, but not feeling any pain is actually an extremely dangerous condition since it also leaves him ignorant to crippling injuries, which may disable him without even realizing why. Thankfully, he also has an accelerated cellular regeneration which enables him to heal minor wounds such as cuts, bruises and light burns faster than normal and even recover from minor to moderate blood loss. But this „healing factor“ is limited – he can‘t regenerate critical wounds such as lost of limbs, damaged nerves, and internal organs or fatally damaged cells such as by burning, as such wounds will simply close up faster – resulting in permanent scarring. Nevertheless, these unique abilites make him a powerful combatant who always remains calm through stressful or painful situations, tolerates extreme hunger, unbearable thirst, and strong urges to sleep and can operate on a low power setting for an extended amount of time despite grievous injuries. Farad is slick. Great job! Really enjoying the format detailing the character’s backgrounds and abilities. Trying to unlock the genetic secrets of his people and other human subspecies created by the Mato‘Nai, the Nai’vil Paul Godel (aka Apollo), who runs the genetic research department of the EOS Corporation, conducted a secret genetic experiment and used an advanced version of the technology of preparing recombinant DNA (known as „gene-splicing“) to cut up the DNA molecules of several human test subjects with a criminal past and splice them together with fragments from more than one organism – to be exact: from both Nai‘vil and different animal organisms – in order to create humans similar to the Homo Bestialis (Grimm). Partially successfull, this highly unethical treatment eventually mutated the test persons physically and gave them extraordinary animal-based superhuman abilities. In exchange for their participation and maintaining silence about the source of their powers, the testees received new secret civilian identities with a clean slate. This reply was modified 3 years, 3 months ago by Mad Jack.